I am not happy to acknowledge, but truth is Assad’s regime foiled all Arab and international moves against it and turned the tables on its adversaries in three months. So much so that all sides’ demands dwindled to the mere brokering of a process of reconciliation, hopefully acceptable to President Bashar al-Assad. 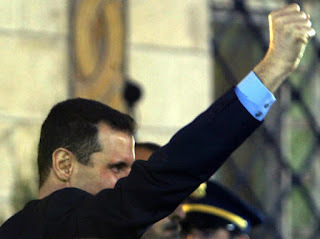 He succeeded in fragmenting international positions – a scenario he used after his assassination of Lebanon’s late Prime Minister Rafic Hariri in 2005. He also succeeded in making foreign countries – including his stalwart opponents such as Europe and the United States -- believe if they brought him down they would get Ayman al-Zawahiri instead and empower extremists to rule a multi-sectarian country. The defeat became public yesterday, when Arab efforts suffered a setback. Proof is Arab countries openly supportive of the Syrian people caved in to the call for a conciliatory solution. The Qatari Prime Minister Sheikh Hamad bin Jassem and Saudi Foreign Minister Prince Saudi al-Faisal, the two hawks in the diplomatic campaign against Damascus, accepted the decision to defer the Arab League solution to the Security Council. This is in spite of the loopholes the Arab League had incorporated in the solution to bail out the regime – such as negotiating reconciliation. Of course, some would make a point of yesterday’s Arab statement deeming the Baba Amr massacre committed by Syrian military and security forces as a crime against humanity. But that’s a moral declaration, no more. Whereas Assad’s reign was precarious six months ago and the international community was ready to draft a resolution mandating intervention and burial of his regime, Assad today is in a stronger position on the Arab and international stages. The drubbing (of Assad’s opponents) could be blamed on failure to unify the Syrian opposition groups and on the Damascus government changing its diplomatic strategy and going on the offensive.